Some of the simplest foods are the most healthful. That’s the case with oatmeal, a whole grain that requires hot water to produce a quick, filling, heart-healthy breakfast. A bowl of oatmeal made with ½ cup of rolled oats provides 4 g of fiber along with 150 calories, 2.5 g of fat, 27 g of carbohydrates and no sugar. The fiber can benefit your cardiovascular health by helping to reduce your cholesterol. Fruits, vegetables, whole grains, beans and legumes are good sources of fiber, and most Americans probably don’t eat enough of it. The Cleveland Clinic explains that while insoluble fiber -- roughage -- helps your digestion, soluble fiber has been shown to reduce LDL, the so-called bad cholesterol. Soluble fiber binds to fats, including cholesterol in your intestines, and helps to remove it from your body. 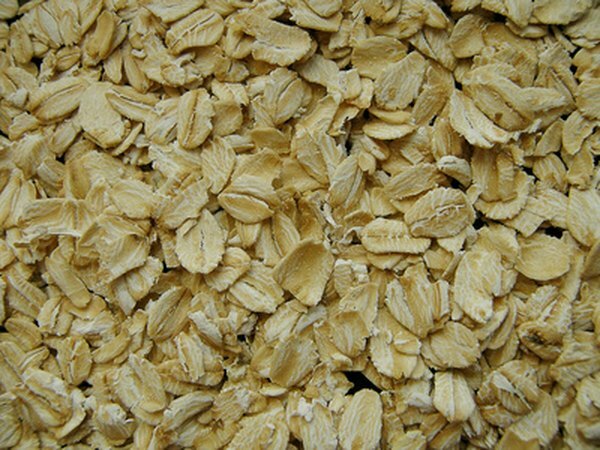 Like many other high-fiber foods, oatmeal provides both soluble and insoluble fiber. According to the nutrition labels on rolled oats, a ½-cup serving with 4 g fiber has 2 g of each type of fiber. Boost the soluble fiber even more by adding fruit that is rich in soluble fiber, such as apples, pears, bananas, strawberries or prunes. Unlike a cholesterol-lowering pill, oatmeal does not come with specific recommendations. Go Ask Alice! of Columbia Health states that two or more servings daily of soluble fiber has been shown to reduce low density lipoproteins, or LDLs. Soluble fiber from whole grain cereals like oatmeal appears to be most beneficial, according to the report, “Health Implications of Dietary Fiber,” published by the American Dietetic Association. The American Heart Association recommends a daily goal of 25 g of total fiber. Oatmeal is often touted as a heart-healthy food. Try to get more benefits by also using oats and oat bran in other foods. You can add it to pancakes, muffins, burgers, meat loaf and stuffing. Be cautious, however, about baked goods that claim to be healthful because they contain oats or oat bran. Look at the nutrition labels, because some might have a lot of added sugar, sodium and fat.